Guys!!! The most upsetting news ever!! Victoria's Secret swimwear is going away forever. I know most of you already know this, but I'm spreading the news. I just adore their bikinis because they're affordable, stylish and super trendy. On the plus side of them closing...everything is on SALE!! Serious sales, up to 40-60% off serious sales. I purchased a one piece bikini for Italy and was pretty pumped to get it for 30% off. Little did I know they keep increasing the sale each week. I've put together some bikinis ill be sure to grab before its too late. This is the one I bought in store for 30% off. Apparently Victoria's Secret will be closing swimwear, and concentrating more on their active wear line. I think thats an amazing idea, although I wish they could do both. I've heard amazing things about the quality and price of their active wear line, so I will picking up a couple of pieces soon. 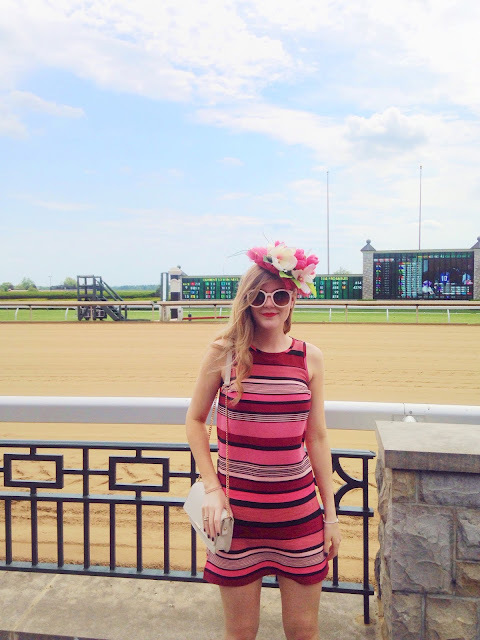 I just got back from the Kentucky Derby and omg I had so much fun!!! What most of you didn't realize is that I didn't actually attend the Churchill Downs Kentucky Derby. Although I did technically attend the Kentucky Derby, it wasn't exactly the real thing. My best friends family moved to Lexington, Kentucky and about five minutes from their house is Keeneland Race Track. Instead of spending $500 in Louisville at Churchill Downs, we only paid $5 to attend the Derby at Keeneland Raceway. Unfortunately no actual races happened there, but it was basically the derby without the actual horses. Everyone parks outside and tailgates until the races start. Everyone still dresses up in the craziest hats and fascinators. You can still bet while inside Keeneland, and even get all the drinks and merch like my mint julep (below) as if you were at the real derby. Only difference is, instead of watching the races live, you watch them on a big screen in the middle of the raceway. So if anyone out there wants the Kentucky Derby experience without the big price tag, I would highly suggest heading to the Keeneland Race Track. It was a must to get a mint julep. Our tailgating spot was quite beautiful. My mom is absolutely the best, she made my fascinator. I don't know how, but that women can create or make anything! !